An unexpected arrival at the Horse & Jockey on Saturday was Cabdriver Dave, who hailed us when we were having coffee at the nice new caff in Hamble-le-Rice and asked us if we knew the Bursledon Blogger. I said we hoped that he might be coming up to the pub and Dave duly rowed up as well. Unfortunately Max couldn't make it but it was great for us as we got a chance to admire Dave's nice cedar strip Cosine Wherry before he had to leave for his evening shift. 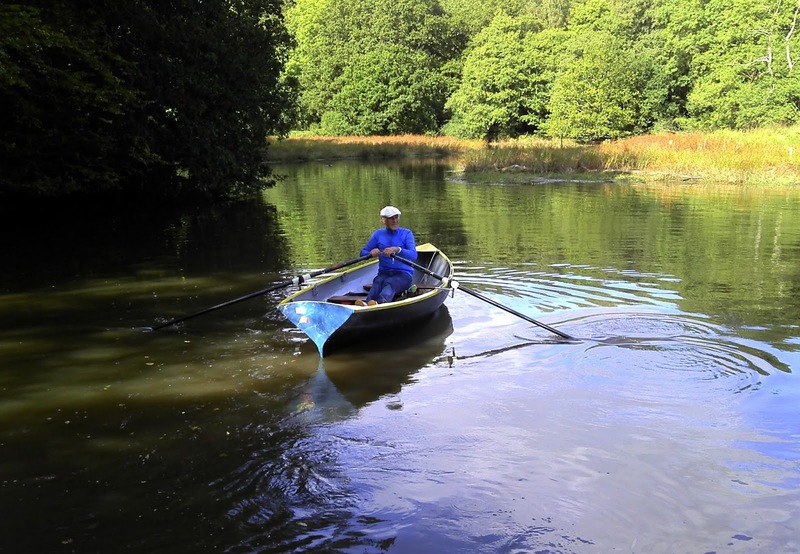 "The Cosine Wherry is a strong, lightweight, beautiful, high performance 14-foot rowing boat, the newest design by John Hartsock of Emonds, Washington. 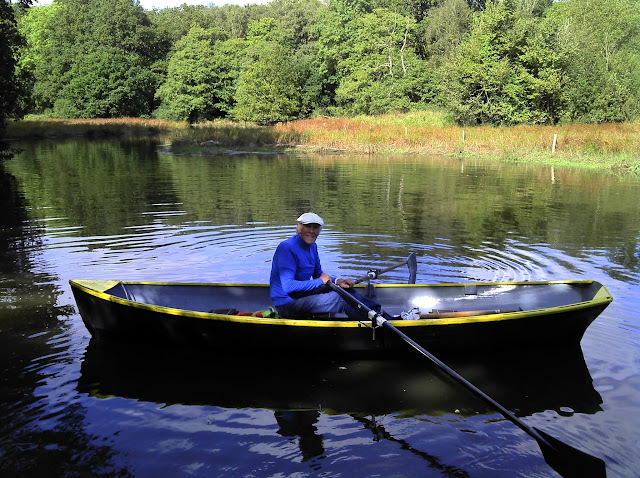 Combining years of rowing experience with his knowledge of computerized hull designs, Mr. Hartsock has created a single rowboat to satisfy the various recreational requirements of a family, the practical demands of the sportsman, and the competitive desires of the serious rower. The Cosine Wherry offers the best of both worlds: it's light, fast, and a joy to row, yet stable, and capable of hauling plenty of passengers and gear." "The Cosine Wherry was designed by John Hartsock and is fully described in WB100. Hartsock used Colin Archer's Wave Form Theory as a starting point and designed the boat so that the curve of the underwater areas followed a Cosine Curve (the cosine of an angle plotted against the angle inself). Having fixed that parameter (the reverse of the usual design cycle) he used John Gardner's and Willit Ansel's research work to determine the final dimensions of the boat. The resulting Cosine Wherry turned out to look pretty much like a traditional pulling boat of the Whitehall type, and Hartsock concluded that the 'builders of small boats in the 19th Century must have been wonderfully intelligent people with an intuitive feel for hull shape and a willingness to communicate with each other.' As suspected Grandad wasn't as stupid as he appeared." "The cosine wherry is an under rated design. For years the "Dinghy" Maggie has featured in the top few of the great river race winning it outright on several occasions. She was joined by a sister ship Aggie a couple of years ago & she also has done well. About time that Ian Hartsock was given the credit for a very fast boat. Wonder if it's available in tan. Wow! that boat even has outriggers, the oars must be 10 feet. I find that 8 foot oars on the gunwhales are plenty, have you at hull speed in no time.